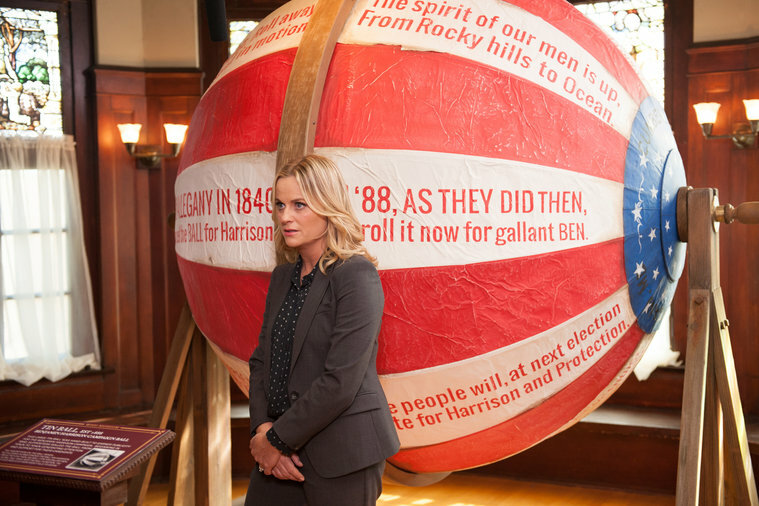 Let’s recap part one of this week’s double episode of Parks and Rec. This is a show that I find better suited for a half hour slot, but still none the less enjoyed a full hour of as well, especially when it moves the story forward like it did tonight. Of course, the quirky citizens of Pawnee never fail to impress. We’ve got the Reasonablists who, and I quote, think the land will be “the place where all human souls will be transmuted when Zorp the Lizard God passes through Jupiter’s sphincter.” Okay… We’ve also got the Indiana Brown Ants which are doomed to be extinct in 200,000 years. Not really that pressing so Leslie passes on that one as well. Luckily, a passionate historian and museum volunteer comes in and explains that the ninth president, William Henry Harrison, once had a hunting lodge on the land, hence making it significant enough to preserve! Just a note about William Henry Harrison, he was the first governor of Indiana territories and then a U.S. president who died 32 days after his inauguration where he refused to wear a coat. Over on the Gryzzl side, Tom, Donna and Ron are trying to figure out how to spice up their bid for the land as well. Tom and Donna want to go with a celebrity endorsement, but Ron is still a little on the fence about it. Apparently, celebrity spokespeople are still all the rage in 2017 though. Elton John just recently bought Chick Fil A. Over at the historic hunting lodge, Leslie sees that it’s just a bunch of collapsed stones and not really a structure anymore. Andy manages to find a bag of old hamburgers and a dead animal though. Leslie needs more for her case. Her, Andy,and April head over to the William Henry Harrison Museum, which was my favorite bit of the whole episode. April describes all of the rooms that the museum has, which are well worth mentioning. There’s the “If He’d Worn a Coat Room” depicting “how great America would have been if Harrison had worn a coat at Inauguration and not died.” There’s the “Other Things that were Famous for One Month” room, where video clips of fads like the Harlem Shake play. There’s my personal favorite, the “Other Famous Harrisons” exhibit, which is a bunch of cardboard cut outs where you can take your picture with the likes of Harrison Ford. It’s fantastic and April wants to work there, but unfortunately it’s volunteer only. Her search to find a job she enjoys continues. Ron catches word from Ben, who is running around with newly appointed notary Terry to get Ron and Leslie’s signatures, that Leslie is having success in her bid. Ron tells Tom and Donna to book Annabel Porter who runs lifestyle company Bloosh. 2017 Update…she is also the two time Pulitzer prize winner for best Top Ten Listicle. There is hope for millennial writers after all! She lets them in on all of the new trends including a new “Beef Milk” where milk is squeezed out of the tiny hole of a cow. Ron calls it milk, which it is, but Beef Milk sells for $60 a gallon and has a wait list. Bravo, Annabel. Ron’s team crashes Leslie’s press conference and you could tell that Donna and Tom were not informed about that…they knew it was a low ball move. However, even after a nasty altercation with Ron, where he tells her she’s not very good at scrap-booking, Leslie’s presentation goes decently well and she does make some solid points. Unfortunately, we’ve all seen a Tom Haverford presentation and with lasers, music, the Somebody’s Daughter Dance team, and headset mics, Gryzzl’s pizazz outshines Leslie’s little bite of history. It became pretty clear that we were not going to get any reconciliation between Ron and Leslie in this episode. I was starting to wonder if they were going to drag it out the whole season.Luckily, it looks like that may not be the case! Later that night, Ben tries to convince Leslie to come with him so she and Ron can both sign the document he needs. The gang had other plans though. Ben had set up a trap and they all lock Ron and Leslie into the old parks department office and will not let them out until they have reconciled and proved it to them over a baby monitor. Ron charges toward the door and the episode ends. Game On. I’m ready for Craig to come back. I love him!